This is the first in a five-part series about teacher sustainability in Los Angeles and California public schools and the available solutions to reversing teacher turnover. When I was growing up in Birmingham, Ala., nearly 30 years ago, the same teachers taught kindergarten year after year. It was almost a given that my sister would have the same four options for teachers at each grade level as I had two years before. Everyone in our community knew that Ms. Mayfield loved giraffe gifts and Ms. Dorsett sang to her students. Teachers only left the classroom when they retired, or perhaps moved to another city. Today, in most public schools in Los Angeles, somewhere between 40 percent and 50 percent of teachers leave the classroom within five years. Let me put that into perspective. That means, on any given school site, that if you have a child who starts kindergarten in 2016, and another one who will start in 2021, approximately half of the staff will be new by the time your second child enters a classroom. In Oakland, that number is a staggering 70 percent. Teacher turnover isn’t just a problem in California. Nationwide, more than 46 percent of teachers leave the classroom within five years (see chart below from researcher Richard Ingersoll). This costs our school districts nationwide over $2.2 billion every year. You can calculate the cost of teacher turnover in your own district by using this calculator from the National Council on Teaching and America’s Future. But this isn’t just a money problem. Expertise is lost. Ask any teacher how long it took them to get really good at his or her job, and you’ll hear almost unanimously, “At least five years.” Teaching is hard—and it takes a handful of years to feel like you know what you’re doing, how to manage a classroom and affect the academic outcomes that you, your principal and the government want. Every time a teacher leaves, academic and social expertise is lost. And who does that hurt the most? Kids. Community connections are lost. Most good teachers work very hard at making positive connections with their students and their students’ families. 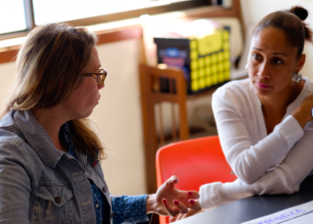 Many great teachers build powerful partnerships with community organizations (like after-school tutoring programs with local businesses or college students). When the teacher who created those connections leaves, it’s very difficult to maintain that same level of engagement with those specific families and community organizations. Schools should be active community spaces, and teacher turnover makes that more difficult to maintain. Emotional stability for students suffers. In many of our communities, especially in underserved urban areas, school sites are one of the most stable fixtures in students’ lives. Most pre-teens and teenagers actively emotionally develop by attaching to adults outside their nuclear families. In addition, students affected by autism, homelessness, childhood trauma and the foster care system need stability in their teaching populations at an even higher level. When teachers make vital connections to these marginalized youth and then leave, the students in our public schools are affected emotionally and academically. School site productivity is affected. Every year, administrators across Los Angeles invest time and money into professional development for teachers. The goal of professional development is to use continuing education to continually increase the productivity and cohesion of a faculty. When teachers leave on a regular basis, administrators must waste time and money repeating professional development for new teachers and never get to move their entire staff forward with higher levels of academic and organizational development. Teachers must spend time and energy investing in new department teams, new personal relationships and “catching new staff up” on school culture, student needs and community expectations. If we intend to provide educational spaces where all students (especially those in underserved, urban schools) thrive emotionally and meet the continually increasing standards set out by the Common Core and the Next Generation Science Standards, we must create educational policy and systems which value the sustainability of the teaching force. Jane Mayer is a former LA Unified and charter school teacher in Los Angeles. She currently directs the Los Angeles region of a nonprofit organization, The Teaching Well, committed to transforming education by prioritizing teacher well-being and sustainability. I am thrilled at the energy around this topic, as evidenced by the comments and shares of the article on Facebook since yesterday. It’s part of my life’s work to engage educators in reimagining solutions to public education, especially as a former teacher. Over the next several weeks, LA School Report will publish four more articles on the topic which detail WHY teachers leave and how we can solve it. If you are interested in sharing your story, email me at janemayer@theteachingwell.org. I would love to hear and integrate your voices into the exposure of this critical issue.